At the 7 Laghi circuit in Castelletto, the second of three WSK Final Cup events was marked by changing weather conditions and tough races. In these complex conditions, Parolin confirmed the excellent potential of its more and more popular chassis, whatever the grip of the track. The intensity of the racing did not always favour to the drivers of the Parolin Racing Team in terms of raw results, but the performance was there. The performance of Brando Badoer in 60 Mini deserves to be celebrated. In line with his race at Lonato, he first took pole position before winning three of his Qualifying Heats. Well established in the leading group of the Final, he led for several laps before the intensity of the clashes forced him to drop to 7th place. Akshay Bohra progressed throughout the weekend and regained another nine places to finish 6th. Keanu Al Azhari also had a very good run after his 4th fastest Qualifying and finished in 9th position after a difficult start to the Final. Douwe Dedecker managed some great runs to return from 30th to 11th before finishing 21st. Finally, Konstantin Krapin qualified very well in the Prefinal (+12 pl) and gained 10 places in the Final to finish 24th. 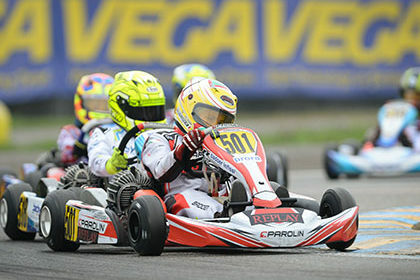 In OK-Junior, Gabriele Mini’ was very disappointed in the Final that he had led for several laps. He kept his chances until the last lap, but an incident decided otherwise and he was then penalised for an unhooked spoiler. Alessandro Cenedese started well with his 10th fastest time, then a 5th and 2nd place in the heats. After an incident in his last heat, his performance finished there. For his second race in Junior, Martinius Stenshorne qualified very well in the Prefinal, but suffered several attacks in the Final before being penalised for his spoiler. 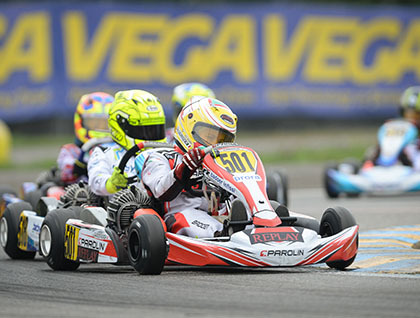 The last race of the season will take place this weekend in Adria for the conclusion of the WSK Final Cup. Parolin will again have the opportunity to demonstrate its strength before the winter break.